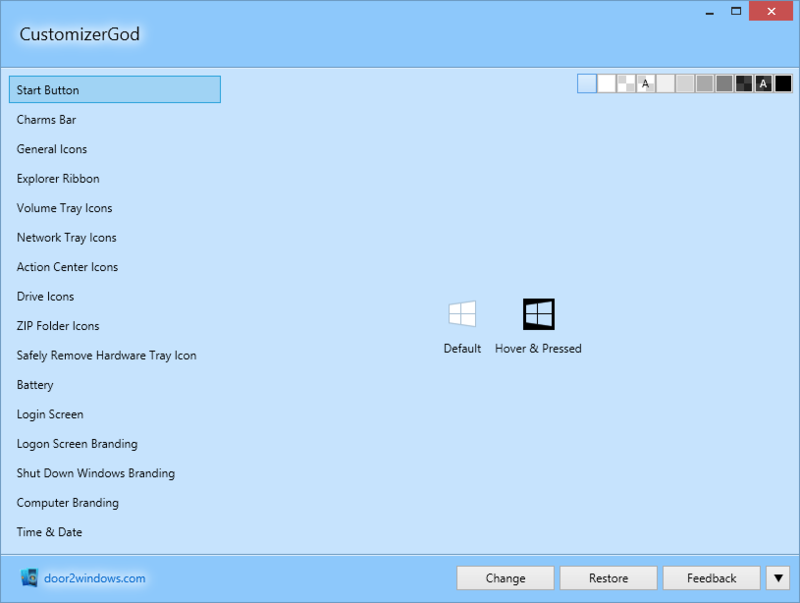 If you are inexperienced with customization and have a fear of messing up Windows, fear not as CustomizerGod is the safest and easiest customization tool you'll ever use. CustomizerGod is the perfect Resource Hacker alternative for editing image resources. Click here to check out all the thousands of resources you can customize using this app in Windows 7 and 8.1. If you are using Windows 7 or earlier, you'll have to install .NET Framework 4.5 first. First click and navigate the tabs in the left-hand pane and find what you want to change. Click the resource in the right-hand pane. Browse for the new resource and click Open. You can open any .png, .jpg, .ico, .gif or .bmp file and the file will be automatically converted to the required format. Select multiple resources by holding the Ctrl or Shift key. To select all resources, click anywhere in the right-hand pane and press Ctrl + A.
Browse for a directory containing the new resources in .png, .jpg, .ico, .gif or .bmp format. The filenames of the new resources should be the IDs of the resources (optionally starting with the # character, like #123.bmp). Move your mouse cursor (hover) over any resource in the right-hand pane to find its ID (if a resource has multiple IDs, use the first one). Just select the resources you want to restore in the right-hand pane and click Restore. Press Ctrl + O (or click the Open button after expanding the menu), browse for the new file and click Open. CustomizerGod will list all the image resources embedded in the file. When you open any file, a .backup file will be saved in the directory of the original file. Don't delete it until the app is closed. Click ≡ (the menu button) in the bottom right corner of the app to expand the window with more options. Current File refers to the file that contains the resources you see in the right-side pane. Using CustomizerGod -> Current File will replace the current file with the backup made by CustomizerGod. All System Files will delete all backups made by CustomizerGod and take new ones. Current File will delete the backup of the current file made by CustomizerGod and take a new one. These two options are useful when CustomizerGod makes a backup of a customized system file instead of an unmodified system file. These options can extract/rename existing 3rd-party resources for use with CustomizerGod. Rename ResHack RC File Resources - Open a .rc file saved by Resource Hacker and the resources saved along with it will be renamed to CustomizerGod-supported names. Extract Resources from RES File - Open a .res file and all embedded resources will be extracted with proper names to the directory of the .res file. Extract Resources from iPack - Open an iPack .exe and all embedded resources will be extracted with proper names to the directory of the iPack. This is not just limited to iPacks, you can also use this option to extract resources from .exe files that have .res files embedded in them. Double-click any resource in the right-hand pane to preview all versions of the resources. Hover over any image to find out its dimensions. If you're using Windows 10, you may notice read-only resources in the left-hand pane. Or if you open shell32.dll in Windows 8+, it too will be loaded as read-only. This happens because the system file containing those resources is digitally signed. Modifications to the file will break the signature and Windows will refuse to load it. This'll hopefully be circumvented in a future update to CustomizerGod. 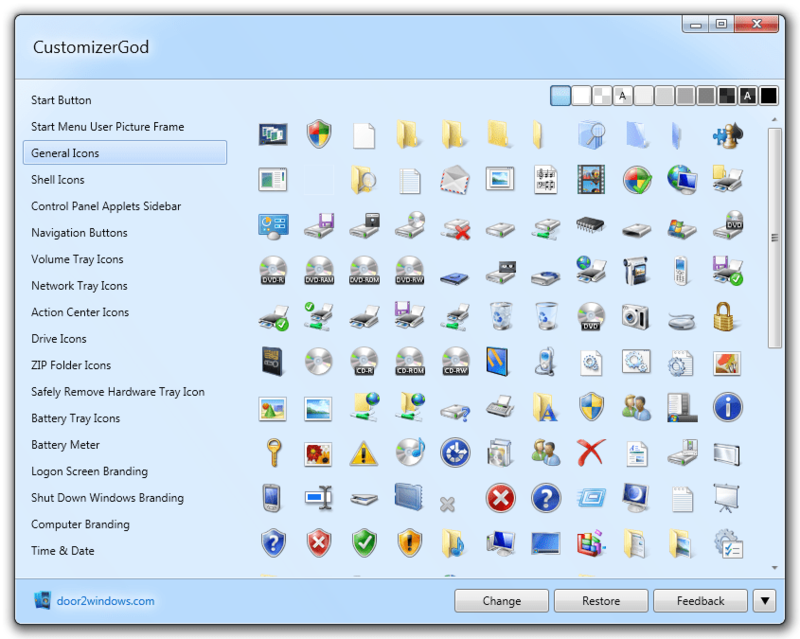 CustomizerGod lets you change the start button in Windows 7 and 8.1 but not in Windows 10. A separate app or a future update to CustomizerGod will let you change the start button in Windows 10. In Windows 10, Microsoft moved the start button resource back to the visual style's msstyle file, like in Windows Vista and XP. So if you really want to change it, use a 3rd-party theme that comes with a custom start button.